Under international law, the land of our nation is all the land in America where Black people have lived for a long time, which We have worked and built upon and which we have fought to stay on. Black people have met this criteria in many areas in this country, but as part of our reparations claim, we seek the five states now known as Louisiana, Mississippi, Alabama, Georgia and South Carolina as our national territory. Reparations are the compensation owed or paid one nation by another nation which has damaged or harmed the first nation and its people unjustifiably. The U.S. owes New Afrikans and the New Afrikan nation billions of dollars for damage to Blacks through the murder of over 50 million Afrikans during the slave trade, during slavery and after slavery and for social, psychological and economic damages inflicted upon Blacks throughout the past 350 years. A plebiscite is a vote by a people to determine or clarify their national status. A plebiscite is generally held to settle a dispute as to which nation a particular people and/or territory belong. 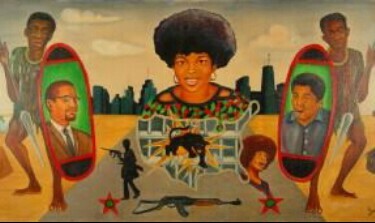 The New Afrikan population in North America has never been afforded the opportunity to determine its national destiny. We are entitled to decide, with all relevant information, whether we and our land should be an independent New Afrikan nation or a part of the United States of America. THE BASIC POLICY OF THE GOVERNMENT The basic policy of the government is to establish national strength through sovereignty, effective international relations, and inherent viability, Our position is that all the land where Black people live, in what has been called “the continental U.S.,” is our land, where we have lived on it traditionally, worked and developed it, and fought for it. This is the subjugated territory of the Republic of New Africa. Our basic national objective is to free this land from subjugation: to win sovereignty. HOW IS THE GOVERNMENT ORGANIZED? Is composed of the President, First and Second Vice Presidents, and Ministers and Ambassadors. Although appointed by the National Council of Representatives, the Ministers and Ambassadors are responsible to the President. The President is the Chief Executive Officer. Powers 1. Appoints those Cabinet Ministers, Ambassadors, their deputies, and heads and assistant heads or the government corporations not selected by the Founding Convention, with the advice and consent of the National Council. Note: Normally each Minister has one Deputy Minister and several Assistant Ministers, who ranks below the Deputy. 2. Carries out legislation and directives of the National Council of Representatives. 3. Carries out aims of the Revolution, initiating necessary actions not prohibited to the President by the Constitution or the laws of the National. 4. Prepares and submits to the National Council a budget reflecting his government’s program. 5. Serves as Commander-in-Chief of the military forces. LEGISLATIVE BRANCH (National Council of Representatives) Consists of members elected by the Founding Convention (all delegate-partic ipants) for a term running from 2 April, 1968 through 1 January, 1970, unless sooner terminated by the Constitution. Powers 1. Levies taxes; approves and funds budget, on an item-veto basis. , 2. Sets policy for the Revolution and makes laws affecting all areas of life, pursuant to the Declaration of Independence. 3. Approves (or disapproves) appointments made by the President, after conducting hearings (two-thirds vote necessary to reject an appointment). 4. Ratifies treaties. 5. Has sole power to declare war (requires two – thirds vote), authorizes military establishment and regulates its size. 6. Audits all operations of the Government, except its own, which are audited by the Court. 7. Meets, once every four months for period not exceeding eight days, at call of the Speaker of the Council. Composed of three Justices, to be chosen by the National Council of Representatives. Three Justices will write their rules and sit as body on questions involving definition of the aims of the Revolution, legality of acts of Government, Officials, or, impeachment ,of Government Officials. They sit individually, on a territorial basis; ..on other matters. Writes constitution and conducts vote on it before 1 December, 1969 (direct vote by all members of nation or by conventions in each Black Nationalist geographic district, simple majority governing). THE CIVIL SERVICE COMMISSION Appointed by-the National Council of Representatives. Hires all government employees under the rank of Minister, Deputy Minister, or Corporation Head. Treasury: To receive and safeguard and release funds; to manage the government’s coin and currency programs. Finance: a. To manage the Land Certificate gram, and all borrowing programs of the Government. b. To manage the budget and authorize release of funds. c. To keep. accurate records of all financial transactions. d. To develop and supervise programs for collections of taxes and other funds. e.To develop and supervise fund-raising programs. f. To manage government-owned business. Justice: To safeguard the Government and citizens against adverse legal processes; to develop and implement programs for meaningful defense of New Africa against the U.S. draft; to develop the New African court system; to develop New African legal codes. Defense: To defend the lives of New African citizens and the territory and property of the Republic of New Africa, to support and promote the national objec‐tives of the Republic; to implement the un-vetoed portions of the Universal Military Training Act; to create and equip a superbly trained Black Legion, fully capable of winning any military engagement undertaken, Education: To create a New African School System, operative within the subjugated areas as well as within New African areas as they become liberated; to develop and implement methods for achieving education of persons outside the school systems. Culture: To promote the creation of a New African culture, soundly based and consistent with the aims of the Revolution. State and Foreign Affairs a. To conduct relations with foreign governments, including foreign aid and trade, b. To develop and pursue programs aimed at achieving early diplomatic recognitions from foreign governments and the United Nations. c. To develop and implement programs to achieve a just reparations settlement for Black people. d. To intercede directly and with the assistance of third-party governments, for New African politiprisoners in the United States. e. To promote the interest of the Republic among the U.S. Congressmen and other Black U.S. officials. Information: To develop and implement programs of Internal Information, designed to inform and motivate citizens to support the aims of the Government; To develop and implement programs of Public Information, designed to win new citizens, create support in the Black community at large, and inform the white public of our true aims and objectives and the peace-loving non-aggressive nature of our intentions; To run the government’s printing plant. Interior: To activate, promote, and guide the Consulates. WHAT ABOUT THE LOCAL ORGANIZATION? The local government is, at the present time called a”Consulate” and it is headed by a Consul. The Consulate organization was created by the first, meeting of the Cabinet to carry out the programs of the National Government on the local level. lt’s officers are appointed by the President, with the advice and consent of the Cabinet. In practice, citizens in a Consulate elect their officers and these are almost always automatically ap‐proved by the President and Cabinet. The idea is to make these local organizations grow into local government. 1. To function as chief officer of the Consulate. 2. To carry out the government program at the local level pursuant to the laws of the Republic and the directives of the President, the VicePresidents and the Ministers. 3. To represent and speak for the Government at the local level. 4. To co-ordinate the work of the Ministry Sections and impose national priorities upon this work to assure that the priorities are accomplished and the total Consulate program runs smoothly. The Consulate (except on some college campuses) is organized like a miniature national government. Each Consulate sets up a “Section” for every Ministry in the Government. The local head of a Ministry Section holds the rank of Assistant Minister. THE DUTIES OF THE MINISTRY SECTION ARE AS FOLLOWS: 1. To safeguard and promote the interest of the Republic with responsibilities of the Ministry. 2. To evaluate local, national and international matters, on a continuing basis, in the Ministry’s area of responsibility. 3. To act promptly in bringing action-recomendations to the attention of the Minister whether of local recommendations are to be developed with the advice and consent of the Consul, but communications between the Section head – and Assistant Minister and the Minister may be direct. 4. To carry out faithfully and fully the specific directions of the Minister but to do so in such a way as to support the Consul and promote the integration and logic of the total Consulate effort. The effort is, of course, composed of the combined program of the various Ministry Section. Every citizen functioning in a Consulate Will therefore volunteer for or receive an assignment to a Ministry Section. WHAT IS A CITIZEN? As a citizen of the Republic, your only national allegiance is to the Republic of New Africa. You pay taxes to our government, participate In New African elections and processes, and work for New African success. You do not vote in any U.S. elections – unless and only if your R.N.A, leaders tell you to as an act of sabotage or as a planned move to get power toward independence. Other acts which are compelled of you by the United States are Invalid and compelled only because the U.S. now has greater power than the R.N.A. Thus, we pay taxes to the U.S, at the present time not because the U.S. is entitled to taxes, or even because other aliens (e.g., Germans, Nigerians, Japanese) residing in America pay them. We pay taxes because the government of our nation wishes to time and control the battle to end unjust taxation, rather than having thousands of individual court cases to fight at one time, arising from thousands of individual refusals to pay. We are in the same position that the U.S. was in before the War of 1812; Before that war, Britain used to stop American vessels on the high ease, take off sailors as British subjects and force them to serve in the British Navy. The U.S. had to endure this indignity until they had power enough to fight a war and stop it. So, too,with us. It is a question of power, as well as right. The U.S. has no right to taxes from us until they settle and compensate us for the free labor stolen from our ancestors during slavery: in other words, they have no right to ask us for money until they pay the money that is owed to us. The U.S. cannot rightfully compel us to serve in the U.S. military. New Africans who are threatened by the draft should consult the Republic of New Africa’s Ministry of Justice. We do not yet have the power to prevent U.S. courts from wrongfully dealing with New Africans, nor can we prevent, yet, many of the other oppressions which are visited upon us as a subjected people by an op‐pressing people and government. But we are working constantly to get that power. In fact, this is what shapes the basic policy of the Government. 1. An isolated hEbola virus comprising a nucleic acid molecule comprising a nucleotide sequence of: a) a nucleotide sequence set forth in SEQ ID NOS: 1 or 10; b) a nucleotide sequence hybridizing under stringent conditions to SEQ ID NOS: 1 or 10; or c) a nucleotide sequence of at least 70%-99% identity to the SEQ ID NOS: 1 or 10. 3. The hEbola virus of any one of claims 1 or 2 which is killed. 6. An isolated nucleic acid molecule comprising the nucleotide sequence of SEQ ID NOS: 1 or 10 or a complement thereof. 7. An isolated nucleic acid molecule comprising a nucleotide sequence of between 4 and 4900 contiguous nucleotides of the nucleotide sequence of SEQ ID NOS: 1 or 10, or a complement thereof; with the proviso that said nucleotide sequence is not comprised by the nucleotide sequence set forth in SEQ ID NO: 20; or between 5500 and 6600 contiguous nucleotides of the nucleotide sequence of SEQ ID NOS: 1 or 10, or a complement thereof. 8. An isolated nucleic acid molecule comprising a nucleotide sequence that encodes the amino acid sequence of SEQ ID NO: 2-9, 59, or SEQ ID NO: 11-19 or a complement of said nucleotide sequence. 10. An isolated polypeptide encoded by the nucleic acid molecule of any one of claims 7-9. 11. An isolated polypeptide comprising the amino acid of: a) an amino acid sequence set forth in any of SEQ ID NOS: 2-19, or 59; or b) an amino acid sequence that has 70% – 99% homology to the amino acid sequence of (a). 12. An isolated polypeptide comprising the amino acid sequence having to 250 contiguous amino acid residues of the amino acid sequence of SEQ ID NOS: 5 or 18 (VP24); 5 to 280 contiguous residues of the amino acid sequence of SEQ ID NOS: 6 or 17 (VP30); 5 to 320 contiguous residues of the amino acid sequence of SEQ ID NOS: 8 or 13 (VP40); 5 to 340 contiguous residues of the amino acid sequence of SEQ ID NOS: 7 or 12 (VP35); 5 to 370 contiguous residues of the amino acid sequence of SEQ ID NOS: 4 or 15 (SGP); 5 to 370 contiguous residues of the amino acid sequence of SEQ ID NOS: 59 or 16 (SSGP); 5 to 670 contiguous residues of the amino acid sequence of SEQ ID NOS: 9 or 14 (GP); 5 to 730 contiguous residues of the amino acid sequence of SEQ ID NOS: 3 or 11 (NP); or 5 to 2200 contiguous residues of the amino acid sequence of SEQ ID NOS: 2 or 19 (L). 13. An isolated antibody or an antigen-binding fragment thereof which immunospecifically binds to the hEbola virus of any one of claims 1or 2 or neutralizes the virus. 14. An isolated antibody or an antigen-binding fragment thereof which immunospecifically binds to the polypeptide of any one of claims 11 or 12 or neutralizes an hEbola virus. (a) contacting the sample with an agent that selectively binds to the virus or the nucleic acid molecule derived therefrom; and (b) detecting whether the compound binds to the virus or the nucleic acid molecule derived therefrom in the sample. 16. The method of claim 15, wherein the agent is an antibody. 17. The method of claim 15, wherein the agent is a nucleic acid molecule comprising a nucleotide sequence having between 4 and 6600 contiguous nucleotides of the nucleotide sequence of SEQ ID NOS: 1 or 10, or a complement thereof. 18. A method for detecting the presence of the polypeptide of claim 11 in a biological sample, said method comprising: (a) contacting the biological sample with an agent that selectively binds to said polypeptide; and (b) detecting whether the compound binds to said polypeptide in the sample. 19. The method of claim 18, wherein the agent is an antibody or an antigen-binding fragment thereof. 20. A formulation comprising the hEbola virus of any one of claims 3 or 4, and a pharmaceutically acceptable carrier. 21. A formulation comprising an amount of a protein extract of the hEbola virus of claim 3 or 4 or a subunit thereof, and a pharmaceutically acceptable carrier. 22. A formulation comprising an amount of a nucleic acid molecule of the nucleotide sequence of SEQ ID NOS: 1 or 10 or a complement thereof, and a pharmaceutically acceptable carrier. 23. A formulation comprising an immunogenically effective amount of the nucleic acid molecule of claim 9 or a complement thereof, and a pharmaceutically acceptable carrier. 24. A vaccine formulation comprising a therapeutically or prophylactically effective amount of the hEbola virus of claim 3 or 4 or a protein extract therefrom, and a pharmaceutically acceptable carrier. 25. A vaccine formulation comprising a therapeutically or prophylactically effective amount of a nucleic acid molecule SEQ ID NOS: 1 or 10 or a complement thereof, and a pharmaceutically acceptable carrier. 26. A vaccine formulation comprising a therapeutically or prophylactically effective amount of a nucleic acid molecule of claim 9 or a complement thereof, and a pharmaceutically acceptable carrier. 27. A pharmaceutical composition comprising a prophylactically or therapeutically effective amount of an anti-hEbola agent of an antibody or an antigen-binding fragment thereof which immunospecifically binds to the hEbola virus of Deposit Accession No. 200706291, or polypeptides or protein derived therefrom and optionally has the nucleotide sequence of SEQ ID NOS: 1 or 10, or a fragment thereof. 28. A kit comprising a container containing the formulation of any one of claims 24-26. 29. A method for identifying a subject infected with the virus of claim 1 or 2, comprising: (a) obtaining total RNA from a biological sample obtained from the subject; (b) reverse transcribing the total RNA to obtain cDNA; and (c) amplifying the cDNA using a set of primers derived from a nucleotide sequence of the virus of claim 1 or 2. 30. A primer that has the nucleotide sequence of one of SEQ ID NOS: 24-57. DEPOSIT STATEMENT  The invention provides the isolated human Ebola (hEbola) viruses denoted as Bundibugyo (EboBun) deposited with the Centers for Disease Control and Prevention (“CDC”; Atlanta, Georgia, United States of America) on November 26, 2007 and accorded an accession number 200706291. This deposit was not made to an International Depository Authority (IDA) as established under the Budapest Treaty on the International Recognition of the Deposit of Microorganisms for the Purposes of Patent Procedure, and is a non-Budapest treaty deposit. The deposited organism is not acceptable by American Type Culture Collection (ATCC), Manassas, Virginia, an International Depository Authority (IDA) as established under the Budapest Treaty on the International Recognition of the Deposit of Microorganisms for the Purposes of Patent Procedure. Samples of the stated Deposit Accession No. 200706291 will be made available to approved facilities for thirty years from the date of deposit, and for the lifetime of the patent issuing from, or claiming priority to this application. This application claims priority benefit of U.S. Provisional Application 61/108,175 filed 24 October 2008; the contents of which are hereby incorporated by reference. The family Filoviridae consists of two genera, Marburgvirus and Ebolavirus, which have likely evolved from a common ancestor’. The genus Ebolavirus includes four species: Zaire, Sudan, Reston and Cote d’Ivoire (Ivory Coast) ebolaviruses, which have, with the exception of Reston and Cote d’Ivoire ebolaviruses, been associated with large hemorrhagic fever (HF) outbreaks in Africa with high case fatality (53-90%)2. Viruses of each species have genomes that are at least 30-40% divergent from one another, a level of diversity that presumably reflects differences in the ecologic niche they occupy and in their evolutionary history. Identification of the natural reservoir of ebolaviruses remains somewhat elusive, although recent PCR and antibody data suggest that three species of arboreal fruit bats may be carriers of Zaire ebolavirus3. No data has yet been published to suggest reservoirs for the Sudan, Reston and Cote d’Ivoire ebolavirus species. However, a cave-dwelling fruit bat has been recently implicated as a natural host for marburgvirus4′ s, supporting the hypothesis that different bat species may be the reservoir hosts for the various filoviruses. Filovirus outbreaks are sporadic, sometimes interspersed by years or even decades of no apparent disease activity. The last new species of ebolavirus was discovered 14 years ago (1994), in Cote d’Ivoire (Ivory Coast), and involved a single non-fatal case, a veterinarian who performed an autopsy on an infected chimpanzee found in the Tai Forest6. No further disease reports have been associated with Cote d’Ivoire ebolavirus, in contrast to Zaire and Sudan ebolaviruses which have each caused multiple large outbreaks over the same time period. In late November 2007, HF cases were reported in the townships of Bundibugyo and Kikyo in Bundibugyo District, Western Uganda. The outbreak continued through January 2008, and resulted in approximately 149 cases and 37 deaths. Laboratory investigation of the initial 29 suspect-case blood specimens by classic methods (antigen capture, IgM and IgG ELISA) and a recently developed random-primed pyrosequencing approach identified this to be an Ebola HF outbreak associated with a new discovered ebolavirus species. These specimens were negative when initially tested with highly sensitive real-time RT-PCR assays specific for all known Zaire and Sudan ebolaviruses and Marburg viruses. This new species is referred to herein as “the Bundibugyo species”, abbreviated “EboBun”. In one aspect, the invention provides the isolated EboBun virus deposited with the Centers for Disease Control and Prevention (“CDC”; Atlanta, Georgia, United States of America) on November 26, 2007 and accorded an accession number 200706291, as stated in the paragraph entitled “DEPOSIT STATEMENT” supra. In another aspect, the invention provides a method for propagating the hEbola virus in host cells comprising infecting the host cells with the inventive isolated hEbola virus described above, culturing the host cells to allow the virus to multiply, and harvesting the resulting virions. Also provided by the present invention are host cells infected with the inventive hEbola virus 5 described above. FIG. 2 represents an alignment of genomes of novel hEbola EboBun (SEQ ID NO: 1) referred to below as “Ebola Bundibugyo” or “EboBun”, and hEbola Zaire (SEQ ID NO: 20); referred to below as “Ebola Zaire `76” or “EboZ” and hEbola Ivory Coast (SEQ ID NO: 10) also referred to below as “EboIC”. The EboBun virus of the present invention is genetically distinct, differing by more than 30% at the genome level from all other known ebolavirus species. The unique nature of this virus created challenges for traditional filovirus molecular based diagnostic assays and genome sequencing approaches. Instead, over 70% of the virus genome was sequenced using a recently developed random-primed pyrosequencing approach which allowed the rapid development of molecular detection assay which were deployed in the disease outbreak response. This random-primed pyrosequencing draft sequence allowed faster completion of the whole genome sequence using traditional primer walking approach and confirmation that the EboBun virus represented a new ebolavirus species. Definitions  The definitions herein provided are operative throughout the entire description of the invention set forth herein, including the Summary of the Invention. An “isolated” or “purified” peptide or protein is substantially free of cellular material or other contaminating proteins from the cell or tissue source from which the protein is derived, or substantially free of chemical precursors or other chemicals when chemically synthesized. The language “substantially free of cellular material” includes preparations of a polypeptide/protein in which the polypeptide/protein is separated from cellular components of the cells from which it is isolated or recombinantly produced. Thus, a polypeptide/protein that is substantially free of cellular material includes preparations of the polypeptide/protein having less than about 30%, 20%, 10%, 5%, 2.5%, or 1% (by dry weight) of contaminating protein. When the polypeptide/protein is recombinantly produced, it is also preferably substantially free of culture medium, i.e., culture medium represents less than about 20%, 10%, or 5% of the volume of the protein preparation. When polypeptide/protein is produced by chemical synthesis, it is preferably substantially free of chemical precursors or other chemicals, i.e., it is separated from chemical precursors or other chemicals which are involved in the synthesis of the protein. Accordingly, such preparations of the polypeptide/protein have less than about 30%, 20%, 10%, 5% (by dry weight) of chemical precursors or compounds other than polypeptide/protein fragment of interest. In a preferred embodiment of the present invention, polypeptides/proteins are isolated or purified. The term “under stringent condition” refers to hybridization and washing conditions under which nucleotide sequences having at least 70%, at least 75%, at least 80%, at least 85%, at least 90%, or at least 95% identity to each other remain hybridized to each other. Such hybridization conditions are described in, for example but not limited to, Current Protocols in Molecular Biology, John Wiley & Sons, NY (1989), 6.3.1-6.3.6.; Basic Methods in Molecular Biology, Elsevier Science Publishing Co., Inc., NY (1986), pp. 75-78, and 84-87; and Molecular Cloning, Cold Spring Harbor Laboratory, NY (1982), pp. 387-389, and are well known to those skilled in the art. A preferred, non-limiting example of stringent hybridization conditions is hybridization in 6 x sodium chloride/sodium citrate (SSC), 0.5% SDS at about 68 C followed by one or more washes in 2 x SSC, 0.5% SDS at room temperature. Another preferred, non-limiting example of stringent hybridization conditions is hybridization in 6 x SSC at about 45 C, followed by one or more washes in 0.2 x SSC, 0.1% SDS at about 50-65 C.
 Percent identity between polynucleotide sequences may be determined using one or more computer algorithms or programs known in the art or described herein. For example, percent 5 identity can be determined using the default parameters of the CLUSTAL V algorithm as incorporated into the MEGALIGN version 3.12e sequence alignment program. This program is part of the LASERGENE software package, a suite of molecular biological analysis programs (DNASTAR, Madison, Wis.). CLUSTAL V is described in Higgins, D. G. and P. M. Sharp (1989; CABIOS 5:151-153) and in Higgins, D. G. et al. (1992; CABIOS 8:189-191). For pairwise 10 alignments of polynucleotide sequences, the default parameters are set as follows: Ktuple=2, gap penalty=5, window=4, and “diagonals saved”=4. The “weighted” residue weight table is selected as the default. Alternatively, a suite of commonly used and freely available sequence comparison algorithms which can be used is provided by the National Center for Biotechnology Information (NCBI) Basic Local Alignment Search Tool (BLAST) (Altschul, S. F. et al. (1990) J. Mol. Biol. 215:403-410), which is available from several sources, including the NCBI, Bethesda, Md., and on the NCBI World Wide Web site available on the Internet. The BLAST software suite includes various sequence analysis programs including “blastn,” that is used to align a known polynucleotide sequence with other polynucleotide sequences from a variety of databases. Also available is a tool called “BLAST 2 Sequences” that is used for direct pairwise comparison of two nucleotide sequences. “BLAST 2 Sequences” can be accessed and used interactively on the Internet via the NCBI World Wide Web site as well. The “BLAST 2 Sequences” tool can be used for both blastn and blastp (discussed below). BLAST programs are commonly used with gap and other parameters set to default settings. For example, to compare two nucleotide sequences, one may use blastn with the “BLAST 2 Sequences” tool Version 2Ø12 (Apr. 21, 2000) set at default parameters. Such default parameters may be, for example: Matrix:BLOSUM62; Reward for match: 1; Penalty for mismatch: -2; Open Gap: 5 and Extension Gap: 2 penalties; Gap x drop-off: 50; Expect: 10; Word Size: 11; Filter: on. Percent identity between polypeptide sequences may be determined using the default parameters of the CLUSTAL V algorithm as incorporated into the MEGALIGN version 3.12e sequence alignment program (described and referenced above). For pairwise alignments of polypeptide sequences using CLUSTAL V, the default parameters are set as follows: Ktuple=l, gap penalty=3, window=5, and “diagonals saved”=5. The PAM250 matrix is selected as the default residue weight table. Alternatively the NCBI BLAST software suite may be used. For example, for a pairwise comparison of two polypeptide sequences, one may use the “BLAST 2 Sequences” tool Version 2Ø12 (Apr. 21, 2000) with blastp set at default parameters. Such default parameters may be, for example: Matrix: BLOSUM62; Open Gap: 11 and Extension Gap: 1 penalties; Gap x drop-off: 50; Expect: 10; Word Size: 3; Filter: on. The term “agent” encompasses any chemical, biochemical, or biological molecule; such as small molecules, proteins, polypeptides, antibodies, nucleic acid molecules including DNA or RNA, and the like. Methods and compositions related to the inventive hEbola  The present invention is based upon the isolation and identification of a new human Ebola virus species, EboBun and the sequencing of the only other known West African Ebola species EboIC. EboBun was isolated from the patients suffering from hemorrhagic fever in a recent outbreak in Uganda. The isolated virus is a member of the Filoviridae family, a family of negative sense RNA viruses. Accordingly, the invention relates to the isolated EboBun or EBOIC virus that morphologically and phylogenetically relates to known members filoviridae. In another aspect, the invention provides an isolated antibody or an antigen-binding fragment thereof which immunospecifically binds to a West African genus hEbola virus of the 5 invention described above, and illustratively including EboBun or EboIC. In one embodiment of the present invention, the isolated antibody or an antigen-binding fragment thereof neutralizes a West African genus hEbola virus. In another, the isolated antibody or an antigen-binding fragment thereof immunospecifically binds to the inventive polypeptide described above. The invention further provides antibodies that specifically bind a polypeptide of the invention encoded by the nucleotide 10 sequence of SEQ ID NOs: 1 (EboBun) or 10 (EboIC), a fragment thereof, or encoded by a nucleic acid comprising a nucleotide sequence that hybridizes under stringent conditions to the nucleotide sequence of SEQ ID NOs: 1 (EboBun) or 10 (EboIC) and/or any hEbola EboBun epitope, having one or more biological activities of a polypeptide of the invention. These polypeptides include those shown in SEQ ID NOs: 2-9, 59, and 11-19. Such antibodies include, but are not limited to, 15 polyclonal, monoclonal, bi-specific, multi-specific, human, humanized, chimeric antibodies, single chain antibodies, Fab fragments, F(ab’)2 fragments, disulfide-linked Fvs, intrabodies and fragments containing either a VL or VH domain or even a complementary determining region (CDR) that specifically binds to a polypeptide of the invention. In a related aspect, the invention provides a method for detecting the presence of the inventive hEbola virus described above in a biological sample, the method comprising: (a) contacting the sample with an agent that selectively binds to the hEbola virus; and (b) detecting whether the compound binds to the hEbola virus in the sample. In one embodiment of the present invention, the biological sample is selected from the group consisting of cells; blood; serum; plasma; feces; rectal, vaginal and conjunctival swabs In another, the agent that binds to the virus is an antibody. In another, the agent that binds to the virus is a nucleic acid molecule comprising the nucleotide sequence of SEQ ID NO: 1 or a complement thereof. In another, the agent that binds to the virus is a nucleic acid molecule comprising a nucleotide sequence having at least 4, 5, 10, 15, 20, 25, 30, 35, 40, 45, 50, 60, 70, 80, 90, 100, 150, 200, 250, 300, 350, 400, 450, 500, 550, 600, 650, 700, 750, 800, 850, 900, 950, 1000, 1500, 2000, 2500, 3000, 3500, 4000, 4500, 4600, 4700, 4800, 4900, 5000, 5500, 5600, 5700, 5800, 5900, 6000, 6100, 6200, 6300, 6400, 6500, or 6600 contiguous nucleotides of the nucleotide sequence of SEQ ID NOs: 1 or 10, or a complement thereof. Furthermore, the present invention provides methods for treating, ameliorating, managing or preventing hemorrhagic fever by administering the vaccine preparations or antibodies of the present invention alone or in combination with adjuvants, or other pharmaceutically acceptable excipients. Furthermore, the present invention provides methods for treating, ameliorating, managing, or preventing hemorrhagic fever by administering the inventive compositions and formulations including the vaccine preparations or antibodies of the present invention alone or in combination with antivirals [e.g., amantadine, rimantadine, gancyclovir, acyclovir, ribavirin, penciclovir, oseltamivir, foscamet zidovudine (AZT), didanosine (ddl), lamivudine (3TC), zalcitabine (ddC), stavudine (d4T), nevirapine, delavirdine, indinavir, ritonavir, vidarabine, nelfinavir, saquinavir, relenza, tamiflu, pleconaril, interferons, etc. ], steroids and corticosteroids such as prednisone, cortisone, fluticasone and glucocorticoid, antibiotics, analgesics, bronchodilators, or other treatments for respiratory and/or viral infections. In another aspect, the invention provides a method for identifying a subject infected with the inventive hEbola virus described above, including: (a) obtaining total RNA from a biological sample obtained from the subject; (b) reverse transcribing the total RNA to obtain cDNA; and (c) amplifying the cDNA using a set of primers derived from a nucleotide sequence of the inventive 5 hEbola virus described above. In one embodiment of the present invention, the set of primers are derived from the nucleotide sequence of the genome of the hEbola virus of Deposit Accession No. 200706291. In another, the set of primers are derived from the nucleotide sequence of SEQ ID NOs: 1 or 10 or any of the inventive nucleotide sequences as described above, or a complement thereof. 10  The invention further relates to the use of the sequence information of the isolated virus for diagnostic and therapeutic methods. In a specific embodiment, the invention provides nucleic acid molecules which are suitable for use as primers consisting of or including the nucleotide sequence of SEQ ID NOs: 1 or 10, or a complement thereof, or at least a portion of the nucleotide sequence thereof. In another specific embodiment, the invention provides nucleic acid molecules 15 which are suitable for hybridization to the inventive hEbola nucleic acid; including, but not limited to PCR primers, Reverse Transcriptase primers, probes for Southern analysis or other nucleic acid hybridization analysis for the detection of hEbola nucleic acids, e.g., consisting of or including the nucleotide sequence of SEQ ID NOs: 1, 10 a combination thereof, a complement thereof, or a portion thereof. The invention further encompasses chimeric or recombinant viruses encoded in 20 whole or in part by the nucleotide sequences. In another aspect, the present invention provides methods for screening antiviral agents that inhibit the infectivity or replication of hEbola virus or variants thereof. The invention further provides methods of preparing recombinant or chimeric forms of hEbola. In another aspect, the invention provides vaccine preparations including the hEbola virus, including recombinant and chimeric forms of the virus, or subunits of the virus. The present invention encompasses recombinant or chimeric viruses encoded by viral vectors derived from the genome of the inventive hEbola virus described herein or natural variants thereof. In a specific embodiment, a recombinant virus is one derived from the hEbola virus of Deposit Accession No. 200706291. It is recognized that natural variants of the inventive hEbola viruses described herein comprise one or more mutations, including, but not limited to, point mutations, rearrangements, insertions, deletions etc., to the genomic sequence. It is recognized that the mutations may or may not result in a phenotypic change. In another specific embodiment, a chimeric virus of the invention is a recombinant hEbola EboBun or EboIC virus which further comprises a heterologous nucleotide sequence. In accordance with the invention, a chimeric virus may be encoded by a nucleotide sequence in which heterologous nucleotide sequences have been added to the genome or in which endogenous or native nucleotide sequences have been replaced with heterologous nucleotide sequences. According to the present invention, the chimeric viruses are encoded by the viral vectors of the invention which further comprise a heterologous nucleotide sequence. In accordance with the present invention a chimeric virus is encoded by a viral vector that may or may not include nucleic acids that are non-native to the viral genome. In accordance with the invention a chimeric virus is encoded by a viral vector to which heterologous nucleotide sequences have been added, inserted or substituted for native or non-native sequences. In accordance with the present invention, the chimeric virus may be encoded by nucleotide sequences derived from different species or variants of hEbola virus. In particular, the chimeric virus is encoded by nucleotide sequences that encode antigenic polypeptides derived from different species or variants of hEbola virus. A chimeric virus may be of particular use for the generation of recombinant vaccines protecting against two or more viruses (Tao et al., J. Virol. 72, 2955-2961; Durbin et al., 2000, J. Virol. 74, 6821-6831; Skiadopoulos et al., 1998, J. Virol. 72, 1762-1768 (1998); Teng et al., 2000, J. Virol. 74, 9317-9321). For example, it can be envisaged that a virus vector derived from the hEbola virus expressing one or more proteins of variants of hEbola virus including hEbola EboBun, or vice versa, will protect a subject vaccinated with such vector against infections by both the native hEbola and the variant. Attenuated and replication-defective viruses may be of use for vaccination purposes with live vaccines as has been suggested for other viruses. (See, for example, PCT WO 02/057302, at pp. 6 and 23; and United States Patent Application Publication 2008/0069838 incorporated by reference herein). In accordance with the present invention the heterologous sequence to be incorporated into the viral vectors encoding the recombinant or chimeric viruses of the invention include sequences obtained or derived from different species or variants of hEbola. In certain embodiments, the chimeric or recombinant viruses of the invention are encoded by viral vectors derived from viral genomes wherein one or more sequences, intergenic regions, termini sequences, or portions or entire ORF have been substituted with a heterologous or non-native sequence. In certain embodiments of the invention, the chimeric viruses of the invention are encoded by viral vectors derived from viral genomes wherein one or more heterologous sequences have been inserted or added to the vector. The selection of the viral vector may depend on the species of the subject that is to be treated or protected from a viral infection. If the subject is human, then an attenuated hEbola virus can be used to provide the antigenic sequences. In accordance with the present invention, the viral vectors can be engineered to provide antigenic sequences which confer protection against infection by the inventive hEbola and natural variants thereof. The viral vectors may be engineered to provide one, two, three or more antigenic sequences. In accordance with the present invention the antigenic sequences may be derived from the same virus, from different species or variants of the same type of virus, or from different viruses. The expression products and/or recombinant or chimeric virions obtained in accordance with the invention may advantageously be utilized in vaccine formulations. The expression products and chimeric virions of the present invention may be engineered to create vaccines against a broad range of pathogens, including viral and bacterial antigens, tumor antigens, allergen antigens, and auto antigens involved in autoimmune disorders. One way to achieve this goal involves modifying existing hEbola genes to contain foreign sequences in their respective external domains. Where the heterologous sequences are epitopes or antigens of pathogens, these chimeric viruses may be used to induce a protective immune response against the disease agent from which these determinants are derived. In particular, the chimeric virions of the present invention may be engineered to create vaccines for the protection of a subject from infections with hEbola virus and variants thereof. Thus, the present invention further relates to the use of viral vectors and recombinant or chimeric viruses to formulate vaccines against a broad range of viruses and/or antigens. The present invention also encompasses recombinant viruses including a viral vector derived from the hEbola or variants thereof which contains sequences which result in a virus having a phenotype more suitable for use in vaccine formulations, e.g., attenuated phenotype or enhanced antigenicity. The mutations and modifications can be in coding regions, in intergenic regions and in the leader and trailer sequences of the virus. The invention provides a host cell including a nucleic acid or a vector according to the invention. Plasmid or viral vectors containing the polymerase components of hEbola virus are generated in prokaryotic cells for the expression of the components in relevant cell types (bacteria, insect cells, eukaryotic cells). Plasmid or viral vectors containing full-length or partial copies of the hEbola genome will be generated in prokaryotic cells for the expression of viral nucleic acids in vitro or in vivo. The latter vectors optionally contain other viral sequences for the generation of chimeric viruses or chimeric virus proteins, optionally lack parts of the viral genome for the generation of replication defective virus, and optionally contain mutations, deletions or insertions for the generation of attenuated viruses. In addition, the present invention provides a host cell infected with hEbola virus of Deposit Accession No. 200706291,  Infectious copies of West African hEbola (being wild type, attenuated, replication-defective or chimeric) are optionally produced upon co-expression of the polymerase components according to the state-of-the-art technologies described above. In addition, eukaryotic cells, transiently or stably expressing one or more full-length or partial hEbola proteins are optionally used. Such cells are preferably made by transfection (proteins or nucleic acid vectors), infection (viral vectors) or transduction (viral vectors) and are useful for complementation of mentioned wild type, attenuated, replication-defective or chimeric viruses. The viral vectors and chimeric viruses of the present invention optionally modulate a subject’s immune system by stimulating a humoral immune response, a cellular immune response or by stimulating tolerance to an antigen. As used herein, a subject means: humans, primates, horses, cows, sheep, pigs, goats, dogs, cats, avian species and rodents. Formulation of Vaccines and Antivirals  In a preferred embodiment, the invention provides a proteinaceous molecule or hEbola virus specific viral protein or functional fragment thereof encoded by a nucleic acid according to the invention. Useful proteinaceous molecules are for example derived from any of the genes or genomic fragments derivable from the virus according to the invention, preferably the GP, L, NP, sGP, VP24, VP30, VP35, and VP 40 proteins described herein. Such molecules, or antigenic fragments thereof, as provided herein, are for example useful in diagnostic methods or kits and in pharmaceutical compositions such as subunit vaccines. Particularly useful are polypeptides encoded by the nucleotide sequence of SEQ ID NOs: 1 or 10; or antigenic fragments thereof for inclusion as antigen or subunit immunogen, but inactivated whole virus can also be used. Particularly useful are also those proteinaceous substances that are encoded by recombinant nucleic acid fragments of the hEbola genome, of course preferred are those that are within the preferred bounds and metes of ORFs, in particular, for eliciting hEbola specific antibody or T cell responses, whether in vivo (e.g. for protective or therapeutic purposes or for providing diagnostic antibodies) or in vitro (e.g. by phage display technology or another technique useful for generating synthetic antibodies). It is recognized that numerous variants, analogues, or homologues of EboBun polypeptides are within the scope of the present invention including amino acid substitutions, alterations, modifications, or other amino acid changes that increase, decrease, or do not alter the function or immunogenic propensity of the inventive immunogen or vaccine. Several post-translational modifications are similarly envisioned as within the scope of the present invention illustratively including incorporation of a non-naturally occurring amino acid(s), phosphorylation, glycosylation, sulfation, and addition of pendent groups such as biotynlation, fluorophores, lumiphores, radioactive groups, antigens, or other molecules. Methods of expressing and purifying natural or recombinant peptides and proteins are well known in the art. Illustratively, peptides and proteins are recombinantly expressed in eukaryotic cells. Exemplary eukaryotic cells include yeast, HeLa cells, 293 cells, COS cells, Chinese hamster ovary cells (CHO), and many other cell types known in the art. Both eukaryotic and prokaryotic expression systems and cells are available illustratively from Invitrogen Corp., Carlsbad, CA. It is appreciated that cell-free expression systems are similarly operable. In a preferred embodiment an immunogenic polypeptide is a full length EboBun protein. Preferably, an immunogen is a full length EboBun protein of SEQ ID NOs: 2-9 or 59, or EboIC SEQ ID NOs: 11-19, or a fragment thereof as described herein. Preferably, an immunogen is has a minimum of 5 amino acids. As used herein an immunogen is preferably a polypeptide. In the context of an immunogenic polypeptide the terms immunogen, polypeptide, and antigen are used interchangeably. Modifications and changes can be made in the structure of the inventive immunogens that are the subject of the application and still obtain a molecule having similar or improved characteristics as the wild-type sequence (e.g., a conservative amino acid substitution). For example, certain amino acids are optionally substituted for other amino acids in a sequence without appreciable loss of immunogenic activity. Because it is the interactive capacity and nature of a polypeptide that defines that polypeptide’s biological functional activity, certain amino acid sequence substitutions can be made in a polypeptide sequence and nevertheless obtain a polypeptide with like or improved properties. Optionally, a polypeptide is used that has less or more immunogenic activity compared to the wild-type sequence. In making such changes, the hydropathic index of amino acids is preferably considered. The importance of the hydropathic amino acid index in conferring interactive biologic function on a polypeptide is generally understood in the art. It is known that certain amino acids can be substituted for other amino acids having a similar hydropathic index or score and still result in a 5 polypeptide with similar biological activity. Each amino acid has been assigned a hydropathic index on the basis of its hydrophobicity and charge characteristics. Those indices are: isoleucine (+4.5); valine (+4.2); leucine (+3.8); phenylalanine (+2.8); cysteine/cysteine (+2.5); methionine (+1.9); alanine (+1.8); glycine (-0.4); threonine (-0.7); serine (-0.8); tryptophan (-0.9); tyrosine (-1.3); proline (-1.6); histidine (-3.2); glutamate (-3.5); glutamine (-3.5); aspartate (-3.5); asparagine (-3.5); 10 lysine (-3.9); and arginine (-4.5). To: My comrades, family and extended family- please distribute to all those who have given support and resources to this process may (Allah) God bless them. In the spirit of our ancestors, I deeply thank you. On September 15, 2014, I received a notice of action from the national appeals board rejecting the parole examiner’s recommendation to advance my release to April 2015. This denial or rejection of the examiner’s onsite opinion and recommendation is not the first time that we have had this experience dealing with the national parole commission. We obviously, as per required historical practice, will appeal this rejection as it indicates we have rejected the basis of their decision and conclusion. The attorneys and I, and our administrative support group, are already on task. We are very, very excited and in awe of how our mobilization carried out this parole hearing. There has been a ground swell of various people living up to their commitments and words by responding to our request for specific support, contacts, resources and finances that gave this hearing character, integrity and principles that history will charge the parole decision was not justified or warranted. Lets look at where we are; the advance April 2015 date in actuality would advance my release date by 6 months, according to their faulty calculations* (I was supposed to be released in 2011). Six months is very important, and we do not take the denial of this relief lightly, but I am political prisoner. Our expectation for justice is not the paradigm, we seek relief and we wait for justice. Do to their undo process in their calculations, 2016 will be my presumptive release date if I continue as i have for these last 30 years. Evade the traps, set-ups, and tolerate the political targeting there should be no legal or policy rationale to deny that release date which is February 2016. Using this date as a process start, I should be seen by the parole commission 9 months from said date, which will be May 2015. As I told all of you before I am an old alligator, I will survive in mud and water, with your duwahs and prayers. In the interim, we have been in the parallel mode building for a pardon application that is not based upon procedure but on tact, strategy, political capital and timing. This is not the place to divulge every nuance, but I am requesting all those who have supported me for the many parole request to now support me for the pardon unless you have formed a political objection!! This pardon is based upon a Truth and Reconciliation Commission narrative, and as far as I can tell this will be the first opportunity for the movement of our era to apply and request such. Most of our support has been based on this narrative; we stand on principled ground. Many of the present events are suggesting such relief, and we surely can support other political prisoners of our movement by advancing the strategy. I hope during this extended time period all those that can help me to get published the various books in our struggle, that I have the information in history to present, also to allow me to build on the cultural genres that will help uplift our future generations. I am committed to this task; I want to thank my family for their sacrifices in my struggle. In closing, do not feel discouraged, we have done a great job; it has the making and capability to advance a new paradigm. Let’s stay busy. Let’s stay encouraged, let’s be creative and have the audacity to put into the ether a just cause, deserving just results. I thank every single one of you; everyone’s contribution was exactly what we needed. When we said that we did the best we could, we meant every word. Plan on hearing from me in the very near future.